I have really enjoyed watching (and cheering on) IBM’s Watson on Jeopardy the past three days. 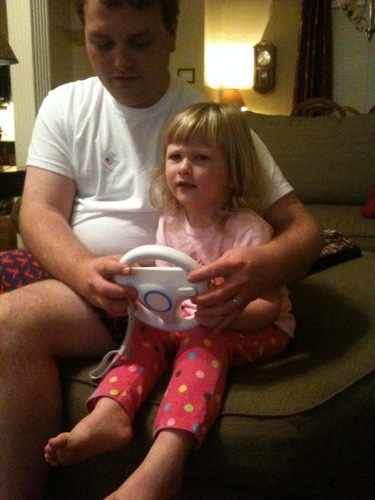 I agree with Ken Jennings–“I for one welcome our new computer overlords”. Watson was impressive. During Final Jeopardy on day two, the category was US Cities. The clue was “Its largest airport was named for a World War II hero; its second largest, for a World War II battle”. I guessed “What is Washington D.C.” because the airports there seemed to fit the description–a person and a place (Reagan and Dulles). I would’ve lost my wager. Ken and Brad did not. They correctly questioned “What is Chicago”. Watson, however, got it wrong. Actually, it got it really wrong. Watson answered “What is Toronto???? ?” Not only is Toronto wrong, it’s not even a US city. They told us that the multiple question marks in its answer means that it wasn’t confident. 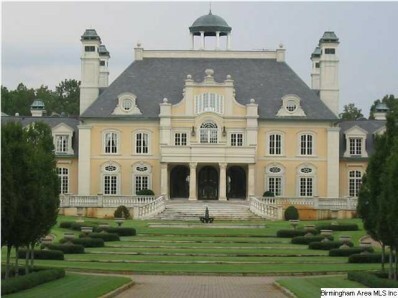 IBM has had very good blog posts and articles on their sites describing the various things about Watson, including how it determines its wager amounts and how they decided on what avatar to use for the show. They also posted a new article explaining how Watson came to the answer Toronto. At that the top of the article there is a little map that shows all of the Torontos in the US which is what IBM is saying helped cause the computer to get the question wrong. But wait, they can’t even label the Torontos right in the map! 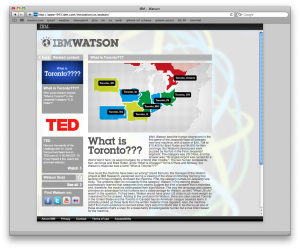 I’m not sure how long it will stay like this, but if you go to http://ibmwatson.com, click the “Find Out More” link under the “What is Toronto” section on the right, you can see it for yourself. I tried to get a deep link to this page, but it breaks IBM’s website. For posterity, I took a screenshot of it. Now, I know that this little map has nothing to do with what’s in Watson’s memory banks or in his programming. I just think it’s funny. 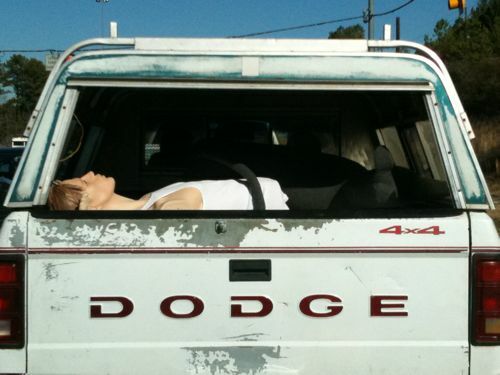 Driving down Valleydale Road one Saturday, we see this strange sight in the truck in front of us. I tell Brian, “Get closer, get closer! I want a picture!” It looks like a mannequin (do you see the feet up by the ear?) and an animal (we couldn’t decide if it was a dog or a deer) in the back. The Uke Fest in Denver with the Leftover Cuties. This guy played the piano and either the trumpet or the accordian at the same time. Yes, he really IS a one-man band. It was pretty cool. Samantha’s Ode to Molly. I neglected to get the first part, which was way funnier. This is a pretty good segment though. 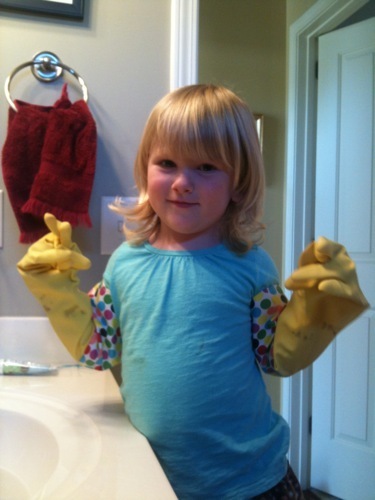 My “Handy Manny gloves.” She went to the sink so she could wash dishes too. 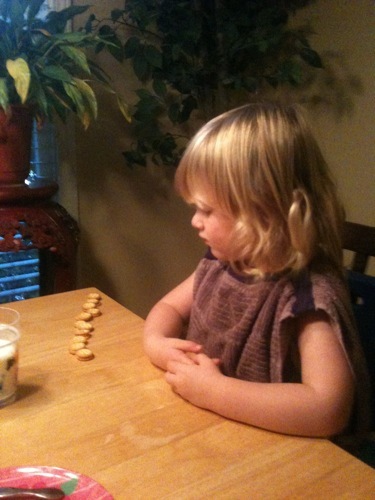 Silly girl lining up her food. This was at Publix. Don’t ask me why someone would design this. Sorry it’s been a little stale around here lately. I guess I’ve been uninspired. However, today’s song has inspired me. Today’s Song? you ask? Let me explain. Every morning I wake up with a song in my head. It can be a song that I heard yesterday, or a song I haven’t heard in years. It’s weird how these songs just come out of my head. I wonder what I’m dreaming about that inspires these things. Anyway, I’ve talked with a very few people about this Today’s Song phenomenon. Some people look at me like I’m crazy, and others say that it happens to them too. I’m wondering if it only happens to music lovers? I’m not sure – I’d love to hear about it in your comments. But, if I don’t grab hold of the song when I first wake up, it is gone forever to the place where forgotten dreams go too. So what is Today’s Song? 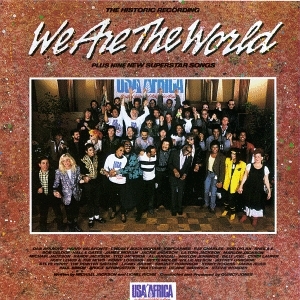 We are the World. Yep, that’s the one. I bet I haven’t heard it since 1986. We had the album when I was a kid. Album as in album, LP, record… Weird.